A bunch of us met for a huneliggers ride through the countryside again today. Wonderful weather for it. It was -7 C this morning, and had "warmed up" to -6 C by the time the ride itself started. That's still T-shirt weather with a velomobile, so of course I rode in my Mango, but whenever you get out you need to put a coat on sharpish. And of course you also need to wear a good warm hat and scarf while riding. But not gloves. The countryside just looks so fantastically wonderful on a day like this. That is the reward for going out on a cold, but bright, day like this. The sun was relatively strong for a winter day, and there was no wind to speak of, so it was really rather pleasant. Good company is vitally important too, of course, and that's the reason to meet up with a bunch of people and ride together. Today, Peter, Robert and Harry were already at the start point. Harry set off towards home quite early as he had only come for the Marathon Winter studded tyres which I had brought with me. Peter and Robert both also live in Assen, so we rode back together through the countryside. The cycle paths locally have not been swept quite so well this year as last. The weather has been difficult, thawing and re-freezing repeatedly. However, the "superhighway" stretch between Assen and Vries was quite good. I had few problems yesterday cycling within the city. The game that is being played is called Klootschieten. In a recent post, I explained what a huneligger is. Last weekend we had a big thaw, and we took the opportunity to go and collect a Christmas tree from one of the local growers. I rode the Xtracycle again, as it's good for moving long things. Orders have continued to come in to the Dutch Bike Bits shop and as ever the customers parcels have made their way to the post office by bike. In this case I had seven parcels in all, for customers in Australia, Canada, Denmark, England, the USA and one staying within the Netherlands. Four of the customers had ordered Schwalbe Marathon Winter studded tyres in the 20" size (which we have in stock now), and those are the parcels stacked on the back of my bike. The other major thing this week was the meeting about the Netherlands Cycling Embassy, which was the subject of another blog post. A small story in the local newspaper. Longer opening hours at the bike shop at Assen's railway station. The shop was previously open from before the first train in the morning until after the last train in the evening. Now the opening times each day will be from 5 in the morning until 2 the next morning, easily covering the times for trains. At any time, the shop will be able to offer bike sales, repairs, rentals (for normal rental bikes and also OV Fiets bike share bikes. The longer shop hours also mean better availability for the approximately one thousand secure indoor cycle parking spaces (this has quietly increased from 750 places last year), though of course the 1550 outdoor spaces can be accessed at any time. Such long opening hours are quite exceptional in the Netherlands. It is rare here for shops to open late at night, and virtually all shops are shut on Sundays and on Monday mornings. As such, this bike shop will be one of very few shops of any kind which are open at such hours. Outside these hours, there is still the vending machine. View of the indoor cycle parking from a platform at night-time. Outdoor parking on the Western side of the line. Outdoor parking on the Eestern side of the line. Assen's population is 65000. The railway station has parking for 2550 bicycles. That's one space for every 25 of the population. You can work out a comparable ratio for your own town. There are other posts about railway station cycle parking. New plans for the railway station will expand the size to 3500 bikes to keep up with increased usage. Another blog post will include details in the future. Assen is not a university town. This is a fairly typical amount of railway station cycle parking for a normal Dutch town without hoards of students to boost cycling numbers. You find such numbers even in villages, at railways stations all across the country. It's sometimes difficult to keep up with progress on cycle parking. I've covered the parking at Groningen's main railway station twice before: First I wrote about the cycle park built in 2006 for 4150 bikes, and then I wrote about how this cycle park had been expanded to accommodate an additional thousand bikes, bringing the total to around 10000. Today it's the turn of the "Fietsflat" in Groningen, an additional one thousand bicycle cycle parking facility which has been built at the station to cater for the ever growing demand. So here it is. An additional two storey cycle park. In the video you see the main "fietsbalkon", now expanded to (officially) 5150 spaces, and also the Fietsflat. You don't see the other smaller parking areas around the station, nor the indoor guarded cycle park which accommodate the rest of the bikes..
Explanatory captions on this video are only visible if you view on a computer and not on a mobile device. Groningen's population is 188000. The main railway station has parking for around 10000 bicycles. That's one space for every 19 of the population. You can work out a comparable ratio for your own town. There are other posts about railway station cycle parking. Until 2015, cycle-parking capacity at this railway station is to be expanded at a rate of 500 bicycles per year. It's just been announced that 16 new long distance inter-city cycle routes will be built across the country with central government support of 21 million euros and local council support making up the rest of the 80 million euro combined cost of the schemes. The new routes are targeting places where presently there are traffic jams on the roads, the intention is to convince drivers to cycle. Not only commuters, but also employers are interested. Cyclists are less likely to be ill, need no car parking space, have more reliable working hours due to not getting stuck in traffic jams, and also improve the environment. These routes are particularly planned to support existing busy commuting routes of up to 15 km in each direction as this is seen as a distance which you can reasonably expect people to ride. The existing cycle paths will be upgraded to have better surfaces, better signs and better lighting. Also there will be improvements to bridges and tunnels. A faster cycling route improves how well cycling competes with driving. The potential is large because more than half of all commutes in the Netherlands are over a distance of under 15 km. In the Netherlands, 35% of all journeys under 7.5 km are already by bicycle. Also, 15% of journeys between 7.5 km and 15 km take place by bike. For all distances over 15 km, the numbers drop to just 3% of journeys. However, even for these longer distances that's still a larger percentage by bike than people make even of short journeys in many other countries. See more articles about funding. It's not entirely clear how much of the money here is new, and how much comes from the existing pot. Also see more articles about the Netherlands' growing network of intercity superhighways for bicycles. The statistics for cycling modal share over different distances came from "Cycling In The Netherlands", one of the documents linked from our articles page. 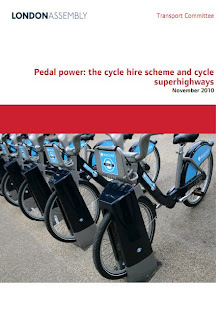 There's a new report out describing the impact of the London "Superhighways" and Bike Hire schemes on transport in the city. This report comes from the London Assembly Transport Committee. It can't get more official than that. Over the last couple of years, both these schemes in London have been accompanied by the most amazing amount of hype. Having seen what was proposed I was skeptical from the beginning about both the superhighways and the bike share scheme. These projects were so wrong-headed that they could never achieve what the promoters said they could achieve. Some people criticised me for saying this. However, if you read the report yourself you can see how well it has all worked. The original wild estimates of 10 uses per cycle-hire bike per day (which I pointed out long ago were rather unlikely) have of course not been met. Actually each bike is used on average about three times per day. In planning, they assumed a "5% shift from car to bike", defined not as a proportion of the modal share currently by car (the scheme could never get anywhere near that) but with rather an odd usage whereby they were talking about 5% of the trips on the bikes being by people who would otherwise have used a car. This would have worked out as a mere 3000 trips per day converted from car to hire bike. However, given the much lower actual usage of the bikes and that the conversion ratio from drivers is actually "less than 1%", the number of trips being made by bike instead of by car is actually under 150 per day. Even 3000 is trivial in the context of a city of eight million people. TFL originally predicted that the largest shift would be from walking (34%), the second largest from buses (32%) and with 20% of users using the bikes as alternative to the tube. The tube figures are born out in reality (though note this is with a much lower level of usage in total, so it's nowhere near the estimated not the same absolute number) but only 8% of users would otherwise take the bus and 7% would otherwise walk. 1% are the afore-mentioned car users. Almost half of all users would otherwise use their own bikes. 84% of registered users of the scheme own their own bike. Now if we take that 20% of riders who would otherwise take the tube, how much of an effect of "relieving capacity" might this have ? 20% of users amounts to about 3500 trips per day displaced from the tube to the bikes. However, London Underground boasts of around 1.2 billion trips per year. Do the maths and you find that the Boris Bikes have displaced just 0.1% of tube traffic. Thus far, the city seems unsure how much sponsorship money they will get from Barclays. I'm not the only one who doesn't know what's going on with this - even the committee describes the funding as "opaque". The corporate advertising is splashed all over everything already, but how much Barclays will actually pay is still unknown. The bike hire scheme has previously been reported as already being "self funding". This never stood up to any inspection, but now we've been given actual numbers to look at. In reality it doesn't seem to come close to doing this. Of course, the same can also be said of almost any large government infrastructure scheme, so that's not a criticism in itself. However, it's also unclear as to why they say that the bike hire should pay for itself ? This is never a consideration when building roads. I'll leave it to others to criticise the slow roll-out of the scheme and problems which have occurred with registration and use. Some problems are to be expected, and whether this is better or worse than any other big project of the British government is open to debate. Currently the plan is to eventually have 6000 bikes and 400 docking sites, compared with the scheme in Paris which currently has 24000 bikes and 1750 sites. Boris Johnson, the Mayor of London, is quoted as saying that he wanted to overtake it, and that a London hire bike was a Rolls Royce compared to the Parisian "deux chevaux" [Citroen 2CV]. Those are words, not actions. "60 per cent of respondents did not feel safer using the cycle superhighways and two-thirds did not feel they were respected by other road users." - hardly surprising given what they look like. "The London Boroughs Cycling Officers’ Group has highlighted the importance of prioritising cyclists at junctions and getting rid of car parking over the cycle superhighways. Gina Harkell, the Vice-Chair of the Group, suggested it would be really nice if one of the cycle superhighways was “a truly dedicated route for cyclists such as those found in Holland, Germany and Denmark.”"
more, is fear of traffic yet the cycle superhighways generally follow busy arterial roads and provide no or minimal segregation from traffic." "All 12 cycle superhighways will be installed, as planned, by 2015." - does it really have to take this long ? The conclusion of their report is overall quite remarkably positive given what they've reported on. Everyone would of course like to see cycling increase in London and around the rest of the UK, but even with the positive spin they conclude, as I do, that not nearly enough is being done to encourage people who don't cycle to want to cycle. To achieve the target now set by the Mayor, the bike hire scheme needs to be used for 40000 trips per day and the superhighways need to be used for 120000 trips per day. London is a city of 8 million people. At a rate of 2.5 trips per day (this is fairly average worldwide) that means that Londoners currently make around 20 million trips per day. If the targets are met, and 160000 trips per day are converted into bike trips by the new schemes then they will have succeeded in a less than 1% modal share shift. However, that's not actually on the cards at all. Currently, only a fifth of hire bike users didn't already cycle in London. That makes for around extra 3000 trips per day. The survey also shows that the "superhighways" currently are used by 5000 people per day, of which only 1% are new cyclists. That's 50 people. If we generously assume they do all of their 2.5 trips per day, every day, by bike they add just 125 trips. Take these numbers and divide them into London's total number of trips by all modes and you find that the massive expenditure on hire bikes and superhighways has resulted in a modal shift of just 0.01%. London needs a lot more than that. The problem remains what it always was. A lack of subjective safety. If you want Dutch levels of cycling in London, you need people to feel as happy cycling in London as they do in the Netherlands. These schemes have come nowhere near providing this. So far, London's initiatives have proven to be merely a very expensive demonstration showing what not to do if you want mass cycling. And to think that it's not that long ago that Dutch newspapers were getting worried that the Netherlands would lose its number one spot for cycling due to initiatives like this. They also believed the hype, that somehow this country would be overtaken. Thanks to Freewheeler for putting me on to this. There are now a variety of different types of countdown timer used on cycle path traffic lights in the Netherlands. This is one example from Assen. Update: In 2016 this junction was transformed in a way which made it far less convenient and more dangerous for pedestrians and cyclists. And another from Groningen. They're not limited to just these two examples, nor to these two cities, but are appearing all over the country as crossings are upgraded. It's very useful to have an indication like this of when the lights will turn green. You know to regulate your speed as you approach the traffic light, so can ride more efficiently. The bridge in Assen was featured on the blog before, when I used the example of the one-way streets into which it leads. The example in Groningen heads towards the main railway station, which has also been covered before. Traffic light cycle times for cyclists are short. This leads to a low average delay for cyclists at these points, often lower than the average delay for drivers. This increases the competitive advantage of bikes over cars. Permeability for cyclists. In both cases in these videos, we're crossing in a direction where motorists can't also drive, meaning that cyclists get more direct routes. Again, a competitive advantage for bikes over cars. Please note that these timers are installed for exactly the opposite reason to those recently installed in London, where similar technology has been used to make pedestrians walk faster in order to reduce delays to drivers, a rather unpleasant idea which Britain imported from the USA. The Dutch use this technology to help cyclists and pedestrians, not to hinder them. It's another good idea seemingly "lost in translation". There are several other posts showing how traffic lights in the Netherlands don't unduly hinder cyclists. What is a huneligger ? Quite a few times now I've posted about rides with the Huneliggers, but I think some people are a little confused about what a "huneligger" is. I've seen some refer to the velomobiles that many of us ride as "huneliggers". One of the hunebedden is shown in the photo above. The word literally means "giant's beds", but actually these rock formations are ancient stone tombs. There are 54 of these in the Netherlands, 52 in the province of Drenthe and 2 in Groningen. The information board explains how the Hunebedden were built around 5000 years ago by the "Trechterbekervolk" (in English, Funnelbeaker people - both languages name ancient people for the artifacts that they left behind). These structures were built to accommodate the dead and were originally covered in soil, which has eroded over time. The stones weigh from 2000 to 20000 kg and were arranged by tens of people working together with levers, sleds, rollers and ropes. I have two recumbents. My velomobile is a Sinner Mango, and I also have a Pashley PDQ. Many thanks to Théan Slabbert for sending me his music to use. It was -5 C as I set off today, which makes it very much Mango weather. Inside the Mango I was warm with just a T-shirt and leggings and no gloves, but to keep my head and neck warm I had a warm hat and a scarf knitted by my Mum. We organise tours in the area which include visits to the hunebedden. "Vehicular Cycling" is a survival technique where cyclists are a small minority without proper infrastructure. It's widely practised in the UK and USA. Indeed, when I lived in the UK, I also cycled according to such principles. In its own context, in a country with a minority cycling culture and no real government support to enhance infrastructure so that cycling can grow to its full potential, it makes sense. However, if cycling is to become "normalized" - i.e. something that the majority of the population sees as a part of their life, which parents encourage their children to do, and spouses encourage their partners to do, then it needs something different. All three types of safety become important. Dutch cyclists are the safest in the world due to infrastructure which keeps them apart from what is the greatest danger to any road user: motor vehicles. They also feel the safest due to street designs which emphasize both social and subjective safety, and this leads to a very high degree of participation. Dutch cyclists are not only the safest in the world, but also the Dutch cycle more than people of any other nation. Almost the whole population (93%) rides a bike at least once a week. Every type of person cycles. During weekdays, more than a million journeys are made by bike every hour. The infrastructure is the reason why. Unfortunately, some cyclists from minority cycling countries still don't understand this, and some campaign aggressively against the very infrastructure which could help to bring a higher cycling rate due to improvements in subjective safety. This video from Mark Wagenbuur shows some of the commonly repeated mantras of the more aggressive anti-cyclepath "vehicular cyclists" and demonstrates how they are misleading and wrong, at least when applied to properly designed infrastructure as shown in the video, and as is the norm in the Netherlands. Well designed cycle paths, and streets designed to prioritize cycling over driving, increase both the safety and speed of cyclists. Some people may question whether cycle paths as in the Netherlands are necessary to achieve mass cycling. My answer to this is very simple: There are no counter-examples. Mass cycling has not been achieved anywhere in the modern world without cycle paths. The more money spent on cycling, the better the result. Luckily, even the best infrastructure in the world isn't actually that expensive, and cycling is something that any country can afford to do properly. Another excellent video from Mark Wagenbuur, illustrating how direct cycle routes can be accommodated in both new and old towns. Note how in some cases nothing more than bollards are required to segregate cyclists from motorists. I've several more posts showing how cycle routes can be planned to be faster and more direct than the roads in the Netherlands. Some of the better examples are from Assen, Groningen and Houten. Making cycle routes shorter makes cycling a lot more attractive, and is a good part of the reason why the Dutch cycle more than people of any other nation. If you have space for it on your handlebars, the Ding Dong bell gives the most sound. Note that there are many copies available of this bell, often painted in different colours, and all that I've heard sound dull in comparison. It's rather subjective, but to me it also gives by far the best sound of the bells. Just listen to that sustain. The Ping bell, which is smallest and weighs just 20 g, is best for those with limited handlebar space or who are concerned about weight, but while the sound is loud, it has little sustain so is not really as effective as a traditional bell. The Classic Brass bell has a remarkably pleasant tone due to the brass, and 96 dBa is still very loud. And for the geeks amongst us, this is how it was done. This blog post can also be read on the DutchBikeBits,com blog. Dutch cycle paths are not completely perfect. Nor are the roads. There are over 29000 km of separate cycle paths in this country and 120000 km of roads. It would be a miracle if all of it was perfect in every detail all the time. Mostly the problems are quite minor, and the result of older provision not having been updated, or surfaces being a bit past their best. However, very occasionally you find something which is simply bad design. On a recent ride to visit a friend in Deventer, I came across this example. It was not on the main route, and I shouldn't have been here. I only found it after making a wrong turn into a housing estate. As you can see, I had to get out of the Mango and pick up the back end to turn through this tight corner between unnecessary barriers which had been put in the way. I suspect this also causes problems for people who have child trailers, bakfietsen, or any other more unusual bikes. Nowhere that you have to get off your bike and lift it can be classed as good quality infrastructure. It's precisely the sort of nonsense that is so readily and commonly criticised in the UK. Indeed, I used to criticise it myself. And there's a Dutch website which keeps a log. However, the big difference is in the frequency with which you find such things. This is only the second such obstacle that I've found in the three years that I've lived in the Netherlands, and I had to travel 60 km and accidentally take a wrong turn through a narrow alley to find it. In Cambridge, I could find any number of such things within a very short distance from home. So many, in fact, that I stopped bothering to take photos and update the website on which I put them. The other horrible barrier that I found is here. It's worth pointing out that the only reason I found this obstruction in Raalte is because I was seduced into going too far along a very nice cyclepath in the town. It was when I decided to change direction that I found this short path and its barrier. Raalte has plenty of other good cyclepaths which make the efficient network needed to support a high cycling rate. Another of Mark Wagenbuur's videos. He says: A bicycle friendly junction in the historic city center of Utrecht in the Netherlands. A main hub for cyclists going to the city shopping center and back to its suburbs. It is actually a bridge with a junction on either side. Cars are discouraged to use this bridge. For motorized traffic almost all the streets are cul-de-sac streets. The result is a friendly junction with large numbers of cyclists that weave in a very relaxed way. Note that hardly anyone ever stops. The cycling really is non-stop. Mistakes are made every now and then (there is even a near collision between a car and a child on a bike in the video) but mostly all traffic flows very well. Mark continues: A motorway was planned on this very spot in the 1950s and 60s. When building for that road began, there were increasing protests against it and all the demolitions that went with it. The opposition became so strong, that in the 1970s the works were stopped and the road was never finished. Building was stopped just before this area was reached. That is why the bridge stayed as it was. Since then motorized traffic was diverted and it has decreased so much that even this 1930s bridge became too wide. Half of the bridge is now side walk. The other half is mainly used by bicycles. Cars driving here really have to be in the area. The unfinished city ring road never really served a purpose. It took the city 30 years to realize that it was best to reverse the situation. After bringing the water back to a place where the road was never built (there the old city moat had been a parking lot for 30 years) it was clear to everybody that this was really what should be done. It took yet another 10 years for the works to start to bring back all the water. Soon the 1970s inner city ring road that should never have been built in the first place will be completely removed. This type of road often confuses outsiders. It looks initially like any road anywhere else in the world - "shared" equally by drivers and cyclists. Sometimes people who ought to know better but have actually missed the point entirely feel that they have a need to point out that "there are also lots of places when cyclists have to mix it with other traffic" in the Netherlands. However, that is to completely miss the point. Actually, cyclists are nearly 100% segregated from drivers in the Netherlands. Due to the way that planning of roads works here, this "mixing it" is not on an equal footing at all. Cycle routes are unravelled from driving routes. The second video shows an example. This is is a through road for cyclists, but not a through road for drivers. In fact, drivers are strongly discouraged from using this road, and that's the reason why there are so few in the video. It's not an isolated case, but the norm for most such areas in most cities in this country. Similar results are achieved across the country by using one way systems and bicycle roads. Cyclists are segregated from the majority of motorists even on roads like this where there are no cycle paths. That is why the majority of cycling happens without interaction with drivers, even though there are 130000 km of road in this country and "only" 35000 km of cycle path. That is how subjective and actual safety is maintained even when the road appears to be open to cars. I should point out that the priority at a junction like this in the Netherlands works such that everyone, whether driving or cycling, should give way to anyone else, whatever mode of transport they are using, who comes from their right. The speed limit is 30 km/h. And yes, I tried responding directly on Carlton's blog to point out that he'd got the wrong end of the stick, but my reply did not appear there. Explaining such things is a part of what we have tried to do on our study tours. I know it's actually only Autumn at the moment, and we've barely had any frost yet, let alone a single flake of snow, but preparations for the snow and ice in winter have begun. The video shows what has been happening in Emmen. They've been trying all the equipment out to make sure there are no unpleasant surprises when winter arrives. As a reminder of what winter is like, and how well these preparations work, take a look at the posts from last winter. Emmen is the largest city in Drenthe. It's got a larger population than Assen, the capital of the province, where we live. A nice promotional video from Amsterdam. You'll see a good cross-section of cyclists. It could, of course, be anywhere in the Netherlands. I first saw this video a while ago, but didn't get around to putting it on the blog. Judy saw it (again) today and said she liked it - good enough reason to put it here in case any of you had not seen it before. Our local paper, the Dagblad van het Noorden recently listed the 12 worst cycle paths in the province of Drenthe (we live in Assen, the capital of Drenthe). The winner was a recreational cycle path near where we live. While most cycle paths in the Netherlands are wide, smooth and a pleasure to ride on, this one is narrow, not properly surfaced and a bit bumpy. However, it's recreational ! No-one forces you to cycle along it. Actually, I quite like it. I've ridden along there a few times, and it's a nice change from the normal "perfect" bike paths. It's very much a recreational path. The winners of this prize, the Natuurmonumenten organisation, are somewhat displeased, as they see it as an old cart track which they made accessible, and which the ANWB then made a part of the local fietsknooppuntennetwork of recreational routes. This caused it to be used more often than it used to be due to signs and maps telling people to use it for recreational trips. See more about normal standards for cycle paths.